Longest lasting, most durable music stand made. Rugged, all-aluminum,lightweight desks are ribbed for extra strength. Its powder coated, glare-free, black textured finish resists scratches and chipping. Solid-brass bearings, greaseless heavy-duty chrome inner shaft, and the original "Magic Finger Clutch" provides one-hand friction grip. Secure at any height, even with a heavy load of music. Perfect for orchestras, school bands, and individual musicians that demand high quality and durability. This is our most popular music stand. 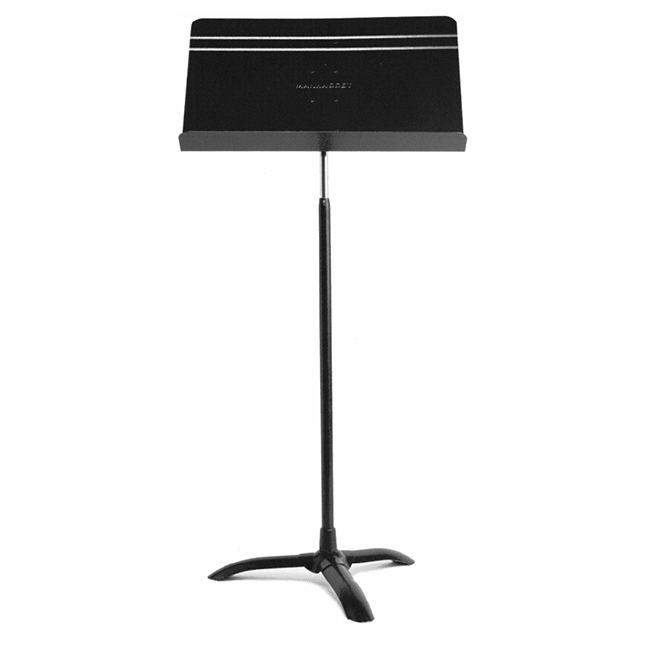 The Manhasset Symphony Stand is used by more schools than all other music stands combined. Our Symphony Stand desk is 20" wide x 12 1/2" high with a 2 1/4" lip. The height of this music stand varies infinitely from 26" to 48" (lip to floor), with a maximum overall height of 60 1/2 inches.